Q: So, really as one the first students of sangha, tell me how it all started? I met Thomas in the back of a limo going to a wedding, which is one of my favorite stories. He was so bright, so full of life. I was immediately like, “Who is this? I’ve gotta talk to this guy.” So we spent the whole wedding with another mutual friend, just really connecting. Thomas mentioned he had just come back from China and was headed out on a weeklong silent retreat. And I was like, “What? What?” That was a completely brand new concept for me. So I asked him to tell me more about meditation and he said, “I would love to. Would you be interested in sitting with me sometime?” So we started sitting together. Once a week he would come over and we would sit, and he would give me guided practice, and I would give him chocolate to make it worth his time. He was always the most appreciative recipient. I was so lucky to have that foundation to my practice. It was soon after that that Tom moved into his new place and we started sangha on Lincoln Street. There was no stopping it at that point. Q: What are the shifts you noticed in your practice? How has your practice evolved? Great question, for one thing I’ve developed a deeper nature practice; more appreciation and love for nature, and that’s something that really sustains me and gives me life. In nature - when I’m present to nature - I feel like everything is okay. I can hear, see, and smell so many layers of beauty, and that comes back to me throughout my day. Also, in my business life, in my corporate world, I’ve noticed that I can sit in challenging conversations and work with difficult situations and be okay. I don’t go straight to my worst habits after something challenging and a lot of those negative coping mechanisms have evened themselves out. On a personal note, over the past ten years, I have lost a lot of weight. And practice has given me a new understanding of what that addictive quality was. Mindfulness helped me smooth out the rough corners. I definitely had a disconnect with the religion I grew up with; with mindfulness practice, I was able to find harmony there. In a lot of ways my path hasn’t been traditional, but I credit mindfulness for making me okay with that. I still experience sadness and uncertainty, loneliness, but I’m okay with all of those feelings. Q: What does your practice look like these days, what is alive for you these days? What is coming up for me more and more is how precious this world is and how fleeting and fragile it might be. My responsibility is to consume as little as I can, to give back and to take joy. In a way, minimalism. I’m learning to be okay with consuming and needing less, and finding fulfillment in what is already here, all the time. I do sit daily and that’s important; my practice is with me in motion throughout the day also. If I have a value or goal, mindfulness creates a framework or structure to make that possible. With it, I move through things more fluidly and it’s so much easier to accomplish something when the action is fluid! So, I can do more, achieve more, when I’m mindfully involved. Q: What is the importance of community for you? I don’t know if other people feel this way–but it’s like when I least want it, that’s when I need community the most. And somewhere in me is an extrovert that gets in to the group and connects and it feels like I’m contributing. There is a beautiful yin yang quality to group. At times it pulled me out of a rut, it nourished me, it revived me–it kept me in the practice. We talk about the Buddha, Dharma and the Sangha in mindfulness practice. 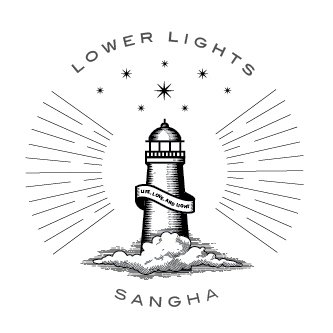 The Buddha being the self and self-practice, the Dharma being the words and the beautiful language and instruction, which I find with books, podcasts, magazines, and online materials–but it’s the sangha, the community, that I believe holds all of it together.